Almost A Hero is probably one of the most addicting RPG clicker games you will find out there today. In this incremental RPG clicker game, you will meet 13 wannabe heroes, also known as the most useless idiots to walk this earth, who embark on a quest to be slightly less useless idiots.They say neve... xem thêm Almost A Hero is probably one of the most addicting RPG clicker games you will find out there today. In this incremental RPG clicker game, you will meet 13 wannabe heroes, also known as the most useless idiots to walk this earth, who embark on a quest to be slightly less useless idiots. Your team of almost heroes is a bunch of deeply unique and deeply flawed individuals who have been chosen for greatness. Heroic, noble, enlightened... Just 3 of the many words they can’t spell. They will set off on an epic journey that will turn them from zeroes to almost heroes. Or dead people. More likely the latter. 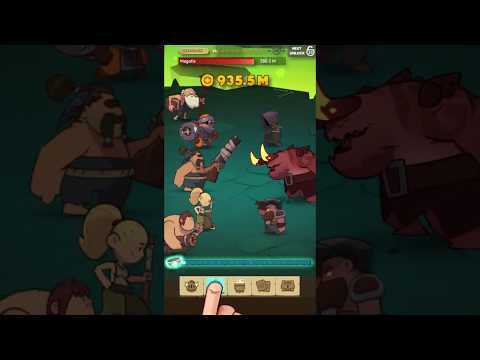 If you are into clicker games, RPG clicker game or incremental idle games, get ready to discover your next serious addiction with “Almost a Hero - RPG Clicker Game”. In AaH you’ll find idle heroes with upgrades, quests, ancient artifacts and secrets to unlock to become almost heroes. Oh, and there’s lots of clicking to do. Yup, that’s what clicker games are all about. Have you nearly got what it takes to become almost a hero? Download one of the most addicting clicker games, Almost a Hero - RPG Clicker Games today and lead your idle heroes to victory before it’s too late!